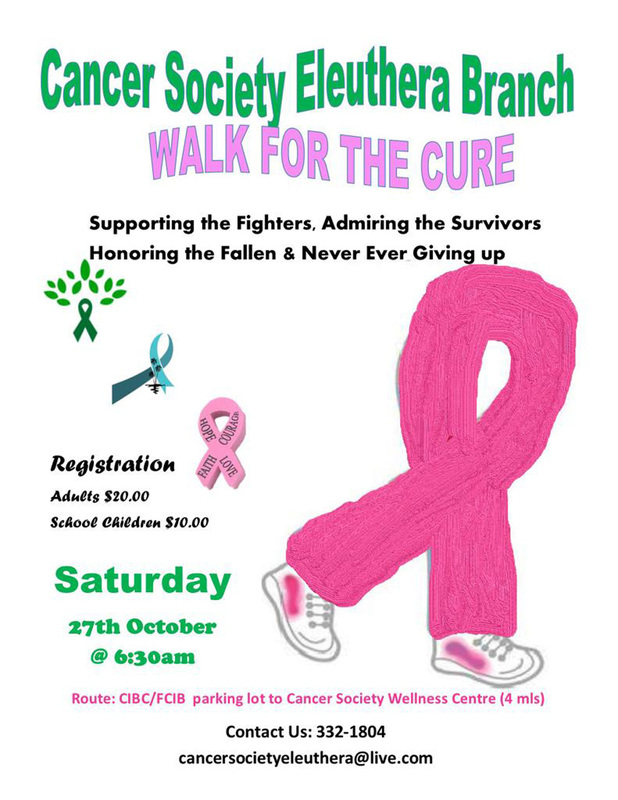 The Cancer Society of Eleuthera Branch will host their annual Walk For The Cure fundraiser on Saturday, October 27th, beginning at 6:30am. The walk will start at the CIBC/FCIB parking lot in Governor’s Harbour and end at the Cancer Society’s Wellness Center in Palmetto Point – a distance of approximately 4 miles. All are invited to sign up to participate today! Registration is $20 for adults and $10 for school children. Call 332-1804 or email CancerSocietyEleuthera@live.com. CSE Walk For The Cure, Saturday, October 27th – begins at 6:30am.